Provided by the Friends of the Huron Mountains The map released Wedensday by the Friends of the Huron Mountains shows where and how many proposed wind turbines would be visible from locations in a 25-mile radius of the proposed wind farm site. 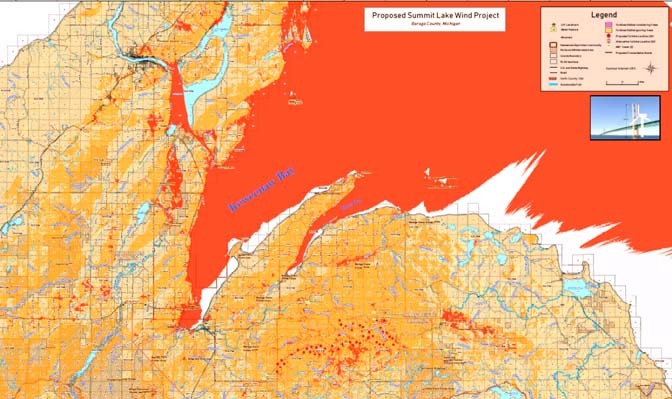 Bright orange areas on the map are where the nacelles of the turbines – the nacelle is the center of the turbine, where the blades meet – would be visible regardless of time of year. The duller orange areas are where nacelles might only be visible in the fall or winter when the leaves have fallen, or if trees were cut down entirely.